When scientists stand up, do they lose standing? Have you heard that scientists are planning a march on Washington? The move is not being billed as a protest, but rather as a “celebration of our passion for science and a call to support and safeguard the scientific community,” although it comes as a direct response to recent policy changes and statements by the Trump administration. Not everyone thinks the nonprotest protest is a good thing. It’s “a terrible idea,” wrote Robert Young, a geologist at Western Carolina University, in The New York Times. The march, Young said, will just reinforce a belief among some conservatives that “scientists are an interest group,” and polarize the issue, making researchers’ jobs more difficult. Others find that argument less than convincing, pointing out that science and politics have always been intertwined. As the founders of the blog Retraction Watch and the Center for Scientific Integrity, we often see researchers reluctant to push for or embrace change – whether it’s to the conventional way of dealing with misconduct in journals (which for years was basically to not do so) or addressing problems of reproducibility of their experiments. To the timorous, airing dirty laundry, and letting the public in on the reality of science, could endanger public trust – and funding. So this isn’t the first time scientists and engineers have voiced similar concerns. 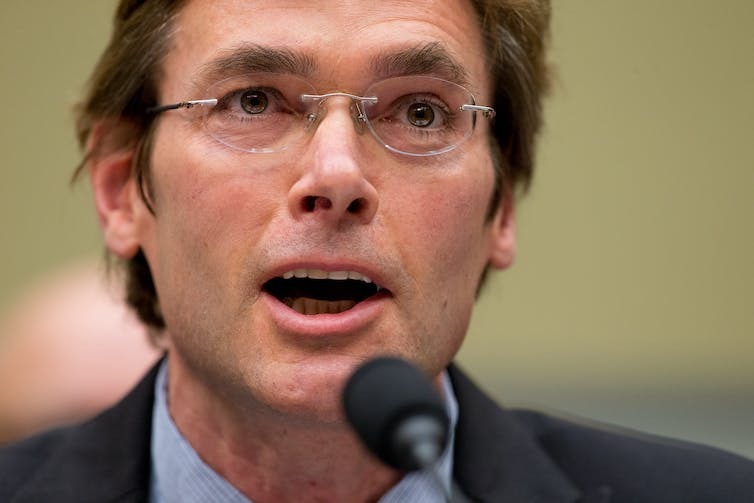 Take the example of Marc Edwards and his colleagues at Virginia Tech: To many people watching the Flint water crisis, they were heroes. After being asked to visit by concerned residents, they found, and announced, that people in the beleaguered city were being exposed to excessive amounts of lead through their tap water. They also launched a crowdfunding campaign to raise money for water filters for city residents and created a website to push their findings about the hazards of the city’s water supply and shame governments at all levels to act. If not for their tireless efforts, thousands of children may have been exposed to dangerous amounts of lead for far longer than they already were. Even the Environmental Protection Agency has acknowledged that it waited too long to sound the alarm. But that’s not exactly how the editor of a leading engineering journal sees things. In October, a remarkable editorial appeared in the journal Environmental Science & Technology. The essay, by University of California, Berkeley engineering professor and Water Center Director David Sedlak, ES&T’s editor-in-chief, expressed concern that some of his colleagues in the field had crossed the “imaginary line” between scientist and advocate. “Speaking out against a corrupt or incompetent system may be the product of a culture where idealism, personal responsibility, and Hollywood’s dramatic sensibilities conspire to create a narrative about the noble individual fighting injustice,” Sedlak wrote. By becoming “allies of a particular cause, no matter how just, we jeopardize the social contract that underpins the tradition of financial support for basic research.” In other words, don’t cross Congress – which many scientists already view as hostile to their profession – and risk retaliation in the form of budget cuts. That’s no small pie, either. Through its oversight of the National Institutes of Health, the Centers for Disease Control and Prevention, the Department of Energy and other agencies and programs, Congress holds the strings to a research purse worth nearly US$70 billion a year. Let’s take a moment to absorb all that. Some (unnamed but easily identified) scientists, lulled by the media, have cast themselves as superheroes in a struggle against villains born of their own conceit. Their arrogance and vanity threaten to awaken the master, who will punish us all for the sins of a few. We rarely get the opportunity to watch a chilling effect in action, but you can almost see the breath of researchers caught up in a debate over the proper role of scientists in the crisis. It’s not just engineers who fear speaking out. “We have too often been reluctant to voice our protest, for fear of incurring the [National Institute of Mental Health’s] displeasure (and losing whatever opportunities we still have for funding),” wrote neuroscientist John Markowitz in The New York Times last fall. In a refreshing piece, Markowitz was arguing that “there’s such a thing as too much neuroscience.” As cofounders of Retraction Watch, a blog that focuses on some of science’s nasty episodes, we are occasionally admonished that pointing out cases of fraud – even when we also praise good behavior – will give anti-science forces ammunition. In some ways, we should be glad scientists are acknowledging these concerns, instead of pretending they’re never swayed by the almighty dollar. But anyone who clings to the notion that science exists in a pure vacuum, untainted by politics, economics or social justice needs also to understand that science is a human endeavor and scientists have the same eyes and ears for injustice and outrage as the rest of us. Although the conduct of science demands honesty and rigor, nowhere is it written that researchers must remain silent when governments or other powerful players either misuse science or suppress findings in the service of harmful policies. And before Edwards and his efforts on behalf of the Flint community, some scientists have spoken out. Clair Patterson, a physical chemist, put himself on a decades-long collision course with industry when he took on lead poisoning. John Snow earned the ire of Londoners when he removed the pump handle on a cholera-infested well, and wasn’t vindicated until after his death. It took Peter Buxtun several years to stop the infamous Tuskegee syphilis experiment; he eventually had to leak documents to reporter Jean Heller in 1972. Edwards and his colleagues, we would argue, are part of a long tradition of bridging the worlds of science and policy. They have been instrumental in bringing not only attention but change to the beleaguered city of Flint. And money: Thanks in part to their pressure, the Senate in September voted overwhelmingly to approve $100 million in aid for Flint, and hundreds of millions more in loans from the Environmental Protection Agency for upgrading municipal water infrastructures and studying exposure to lead. Indeed, scientists who accept funding with the tacit agreement that they keep their mouths shut about the government are far more threatening to an independent academy than those who speak their minds. Science and politics are not always compatible. And science need not always triumph over policy: After all, research shows that steroids improve athletic performance, but we have a compelling political interest to ban them. The same can be said of eugenics. Research must always be ethical, and ethics is a conversation that includes scientists and policymakers. That could easily be said of the March for Science. Except now it’s not just a limb but the entire tree that’s in peril. How can universities keep minorities in STEM graduate programs?